Norsken create educative, cultural and commercial projects using multimedia technologies. They work with museums, exhibitions, real-estate developers and brands. The team is engaged in creative conception, content development, technical production and event management. 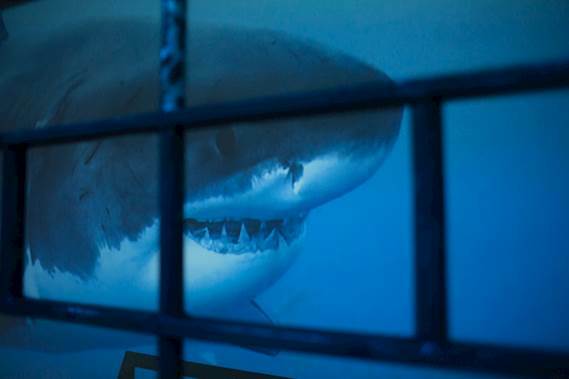 Задача: Norsken had to simulate an ocean at Moscow’s Oceanarium in the centre of Russia’s capital - where visitors could be ‘pulled in’ by a tide of immersive visuals, capturing the diversity of the flora and fauna of the world’s oceans. Решение: Norsken were commissioned for their technical expertise and experience in producing multimedia content, bringing creative concepts to life. They chose 10x Optoma EH200ST projectors for their great functionality and price. Результаты: The installation was mesmerising with razor sharp images blended seamlessly with Optoma’s EH200ST short throw projectors. Moskvarium wanted to create the pinnacle of tourist attractions in Moscow’s aquarium; a multifunctional complex where visitors could be ‘pulled in’ by a tide of immersive visuals, capturing the diversity of the flora and fauna of the world’s oceans. To implement such a bold project, only the best specialists were invited to collaborate. Leading architects, engineers, designers, marine biologists and other experts worked tirelessly to transform the Oceanarium project from a bold concept into a brilliant realisation within two years. 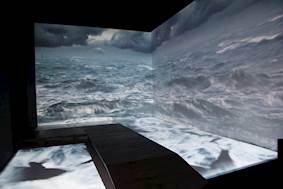 In order to create a realistic and dramatic flow of the water, consistent bright and reliable projectors were required to aid complex masking and blending of detailed, panoramic ocean scenes. Norsken were commissioned for their technical expertise and experience in producing multimedia content, bringing creative concepts to life. 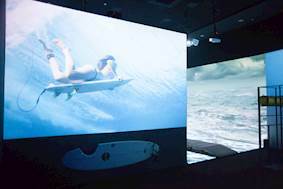 Six Optoma EH200ST projectors were used for the ocean scene blend which displayed detailed Full HD images whilst delivering bright 3000 ANSI lumens. Four were independently ceiling mounted depicting the undersea world. Thanks to their compact chassis and their ability to project large images from a short distance, they allowed for a discreet installation, ensuring the focus remained on the alluring ebb and flow of the ocean. The official opening of the Oceanarium took place in January 2017. Ten Optoma EH200ST projectors were chosen for their reliability, flexibility and great functionality, along with the low running costs of these energy-efficient projectors.